Hello "Grovites" and the rest of the world! Already 7 weeks flew by and we are almost at the end of February. The Good News? The market is giving us hints that this year will be the turning point. Come and enjoy our Coconut Grove beauty! As I write this blog, the sky is a very tropical blue and the lipstick tree I can see from my open window is covered with red fruits. Welcome to this tropical elegant South Coconut Grove Home! Light and space are the best words to describe this totally renovated 3 bedroom, 2 bath home. A formal foyer will welcome you. 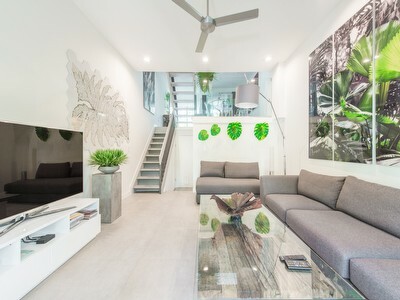 The formal living room has 2 walls with huge glass panels to allow you to admire a tropical garden on one side and a free form pool surrounded by exotic plants on the other. The formal dining room and the state of the art kitchen will allow you to entertain in style. And for more casual gatherings, the comfortable family room with a gorgeous view of the patio will delight everyone. The master bedroom has bamboo floor and Designer Grass Wallpaper. It is an elegant retreat. 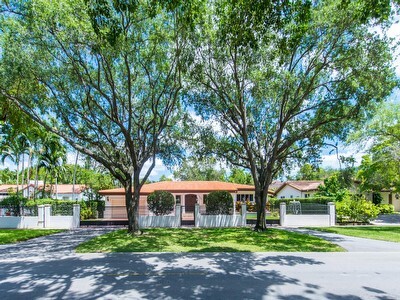 This Mid-Century Modern gem is a completely renovated architect-designed oasis, nestled in deep South Grove under the lush canopy of South Florida foliage. The free-form kidney shaped pool and exotic plant collection is the focus of this elongated u-shaped home. The floor to ceiling sliding glass doors creates a light filled space which changes the sun makes its way throughout the day creating an ambience that is incomparable. This truly unique home features Saturnia marble floors throughout as well as bamboo floors in bedrooms and study with custom-built maple wall unit with recessed lighting. Formal living room, dining room and great room are soaring with exposed beamed ceilings and recessed hidden lighting. Kitchen features all KitchenAid stainless steel appliances and granite counter tops. On top of that, the house is completely wired for complete surround sound inside as well as outside on the patio living room. It is located on the not traveled part of Douglas. It is a the corner of Douglas Rd and Battersea Rd almost accross the very exclusive "Entrada Community". This is the ideal home for a serene Coconut Grove experience and those looking to have fabulous parties!!! Come and live in our beautiful Coconut Grove. We are waiting for you! Waterfront views are at their best from this luxurious building located at 2627 S BAYSHORE DR. Upon entering, the Grovernor house will immediately bring you to a world of luxury and elegance. There are at the moment 16 waterfront condos for sale at the Grovernor. Prices range from $880,000 for unit 506 to $14,600,000 for unit 3201, and breathtaking city and bay views can be enjoyed from all of them. See below for the complete list of units for sale and their prices. If you would like to be introduced to the distinctive lifestyle of this unique Coconut Grove building, visit YOUR website, www.groveexperts.com, or call us. We would be delighted to organize a showing for you. 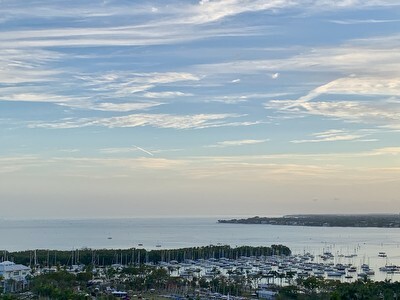 If you want to invest in a condo in Coconut Grove, Call us! Single Family Homes: What sold in Coconut Grove in January 2011? The properties located on Battersea Rd, Bonita Ave, Lincoln Ave, Hardie Ave and Frow Ave were "REO"
This a picture of 3650 Battersea Road. It was a "REO"